The name Entenmann has been an automobile industry institution in and around Stuttgart, Germany for almost 70 years. And for the last 50, our partnership with BMW has been a successful pillar of our family business. In addition to new and used vehicles by BMW and Mini, Entenmann stores cater for almost every auto need from electric cars and sports cars to buying and reselling both modern and classic cars. When it comes to communication and support for customers, chairperson Anja Entenmann pulls out all the stops. Relationships with automobile clubs are maintained in the same careful way as the customer's cars. Replacements, maintenance and restoration are all components when it comes to customer focus - but in the age of digitization, that's not enough any more. Customer satisfaction should be visible online to ensure the continued success of a business. Ms Entenmann, you haven't been with us for long. When did you start using ProvenExpert? 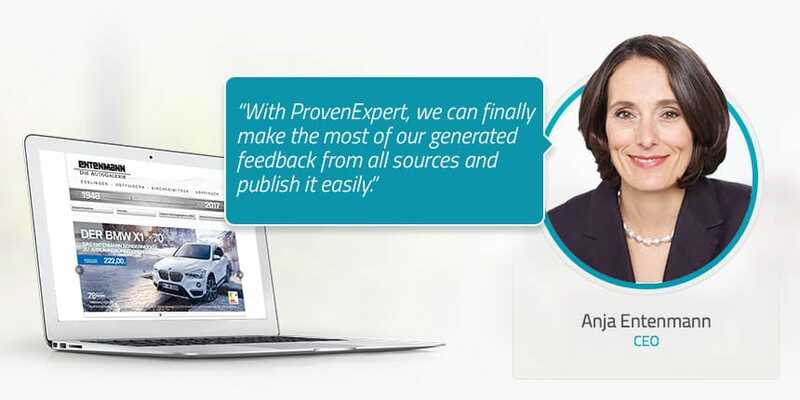 Did you collect feedback from customers before you started using ProvenExpert? In essence, yes, we started years ago. We had customer advice boxes in our service centres. BMW also contacted our customers through „after sales calls“. We'd been actively asking our workshop customers for feedback for a long time. But we decided to row back on that, since our customers were being asked for feedback twice - both by BMW and by us. It was decided that this was excessive. How did you carry out the workshop surveys? We did that through our external call centre. Did you publish the survey results in any form? We only used the results internally, to see where there was potential for improvement. Do you currently use other review platforms besides ProvenExpert? Well, you get feedback one way or another, whether you want it or not - on mobile devices, on autoscout, Facebook etc. These are all portals we use, and we also respond to queries or comments there. What have been your experiences with these platforms so far? That brings us to the next question: Why did you decide to start actively collecting customer feedback? For one, we wanted to aggregate our ratings. Also, we wanted to find out where there were issues - areas where we weren't getting it right. Is it that the coffee tasted bad, or did one of our employees return a call too late? You use the ratings as an internal quality barometer. But there are many other options too. Yes, for instance, there are ways to display customer satisfaction. We have used the ProvenExpert ratings seal and integrated it into our online presence. 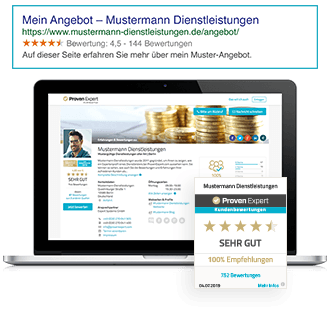 With ProvenExpert's support, we were able to integrate the 5-star rating from customer surveys conducted by our manufacturer into a ratings seal for our website. These reviews are overwhelmingly positive and are clear and easy to understand And a large quantity of positive feedback carries weight, of course. How is this 5-star rating, the surveys conducted by the manufacturer, evaluated? It's a structured interview with the customer. The customer can only respond by giving stars and verbal feedback and they can choose whether they want the feedback to be published. We can make these evaluations more visible by using ProvenExpert. We wanted to use current customer surveys in order to increase customer satisfaction and also have a long-term effect on sales and revenue. We also were hoping for a better overview of all our portals. ProvenExpert has made all this a cinch, because once we receive a new review on a platform such as Facebook or via a mobile device, we receive a notification. We've made our ProvenExpert profile visible on Facebook and our website. What are the advantages of ProvenExpert when compared with Google, Facebook or other classic platforms? It enables us to request feedback in a fast and easy way without causing much hassle for customers. On a platform such as Google or Facebook, it's often a lot more difficult to motivate a customer into giving a review. ProvenExpert has provided you with a customized solution for your business. 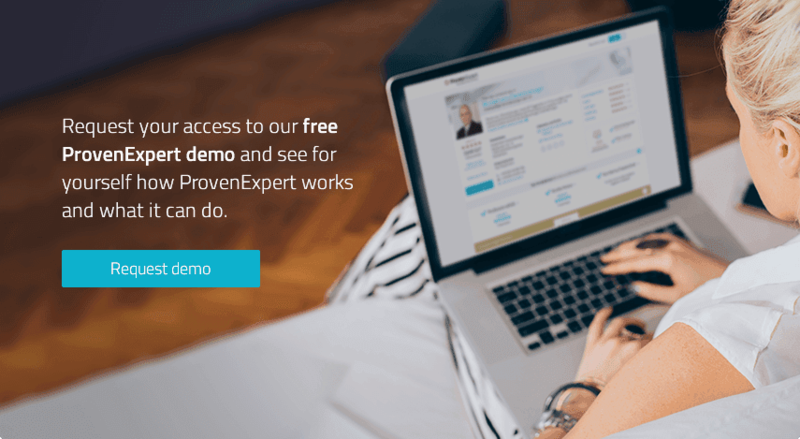 Aside from the integrated 5-star rating, how do you use ProvenExpert? We use it across our entire company. Customers can review our individual branches in different towns, giving us an overview of all our stores as well as a comprehensive solution for feedback. How did you find using ProvenExpert at the start? We received all the basic information for starting out by post, followed by a personal, customized online introduction. If we have questions, we know that support is always at hand. How would you evaluate us right now? I can say without hesitation that I find our cooperation with ProvenExpert really straightforward. We're happy to hear that. Thank you!